Site Search, On-site Search or Internal Search ? HomeSite Search, On-site Search or Internal Search ? When typing “site search in google”, the results are mostly about web search (SEO). Very few results concern on-site search (or internal website search) and they mostly date 3-4 years ago or more. And among those, the majority is about the search box, not the filtering an sorting options. Why is it difficult to find some interesting articles about on-site search ? May be we don’t call it the right way. So what is the right way to call it ? On-site search, internal search, site search ? Or may be it is because while web marketers spend a lot of time on SEO, they don’t spend as much time on Internal search. 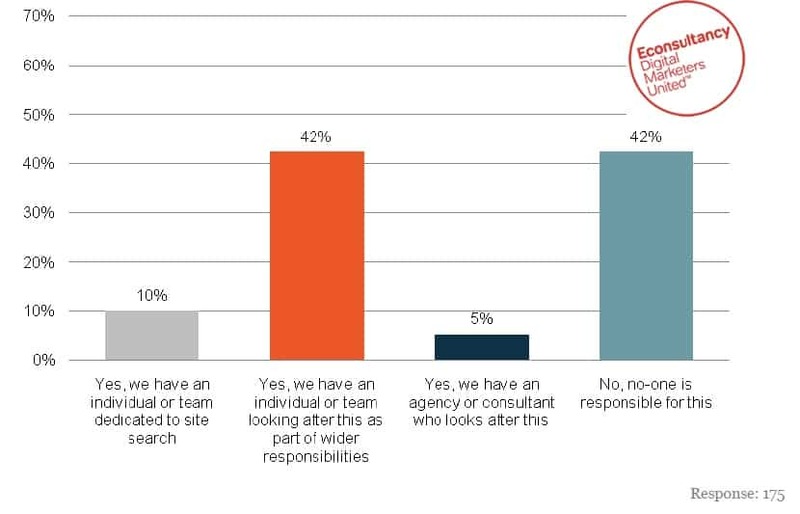 A site search report by e-consultancy and Funnelback shows that typically, 42% of companies have no-one responsible for site search. The above figure represent the percentage of organisation that have someone who is responsible for site search. It is unbelievable that although web marketers focus extensively on conversion, search user experience is not a high priority. Even top players like amazon have serious search failures. Irrelevant results come up in the majority of searches. I don’t even know where to start. The article Onsite Search: Industry Trends and Best Practices by Shalmali Kulkarni has some good examples. Or just try searching for something on amazon and you’ll see what I mean. I talked in a previous post of search boxes and filters limitations on existing solutions. However, using the latest tools available to improve filtering and sorting experience for enhanced onsite search will lead to more conversion. Faceted filtering and sorting is one of them. However, with faceted search, there are cases where the search ends up with only one product, which is not good, as the user should always see more products, but not any product, products that are close to what the user was searching for. In other cases, removing one filter brings the user back to all kinds of products that are far from the initial search. Above is an example of faceted search. 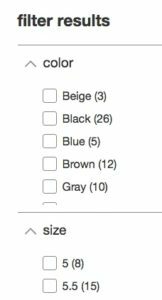 The whole site is scanned an the user sees immediately that all the colors and sizes available, with the number of items for each filter (or facet). It is not perfect though, and we’ll analyse it in details in a next article.